Genesis panels will quickly and easily fit into almost any ceiling grid system. These lay-in ceiling panels are available in the same sizes as fiber-based ceiling tiles, 2 x 2 and 2 x 4. 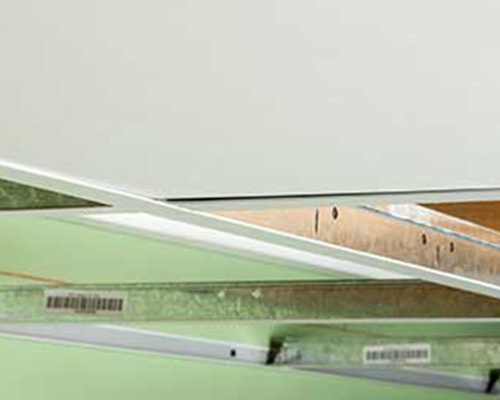 Acoustic control is often seen as the main feature of a ceiling panel. The actual acoustical control provided by traditional mineral board, or acoustic ceiling tiles, is less than many believe. Although mineral board ceiling tiles have higher acoustical control than a drywall ceiling, marketers positioned mineral board tiles as acoustic ceiling tiles as product differentiators in order to sell more tiles. Other important ceiling tile product features that also need to be considered in any drop ceiling are aesthetics, reflectivity, indoor air quality, durability and sustainability. Acoustical control can be addressed in many ways other than ceiling tiles. For example, a carpeted floor is significantly more effective at absorbing sound than most ceiling tiles. Textile wall treatments and drapes also have a significant acoustic deadening effect. Today, new products and technology offer control through sound-absorbing partitions, carpeting, furniture, workspace-to-noise segregation, sound-masking technology, and specially designed sound absorbing materials. Generally, three methods are used to achieve sound control: absorption using drapes, carpets, absorptive panels, etc. ; blocking using walls, floors, and layout; and covering up through sound masking. While all three of these are recommended to achieve optimal results, covering up by increasing background sound produces the most dramatic improvement in speech privacy (a HIPPA privacy compliance concern) with the least disruption and typically the lowest cost. Additionally, one must determine if the area or room in question requires acoustic controls. Common areas or conference rooms definitely need consideration, but do multi-purpose areas or private offices? Given the abundance of acoustic control measures available today, ceiling acoustic considerations have become less important over the last decade. They differ to be sure the panels wont sag. The 2 x 2 is either 4mm or 5mm, depending on the pattern selected. The 2 x 4 panels are 5mm. The water evaporates and leaves no discoloration. Perhaps more importantly, unlike fiber-based ceiling tiles, Genesis does not provide an environment that is favorable to the growth of mold and mildew. Use a skill saw or RotoZip to cut to odd sizes and a hole-saw or RotoZip for sprinkler heads or can lights. The tile can be trimmed with a utility knife. You may also use a metal angle ruler, score it and snap the tile. 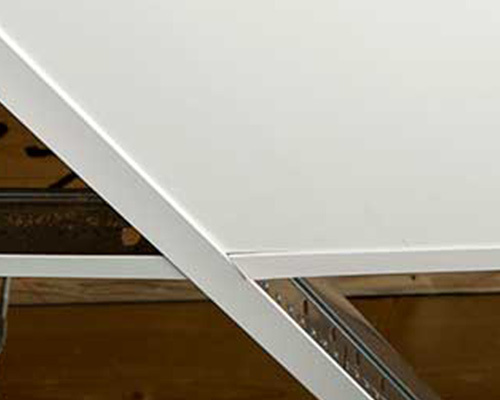 If your Genesis ceiling tile appears to sit higher on the ceiling grid corners, it is likely because of the type of ceiling grid you are using. 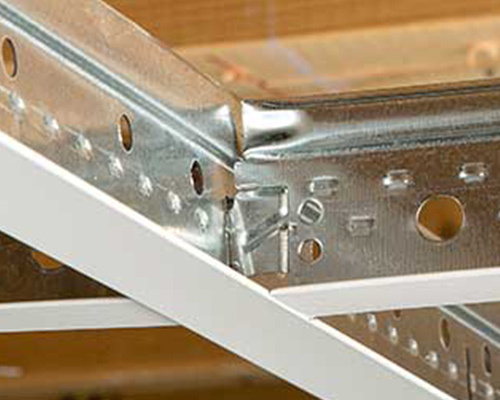 There are two main types of ceiling grid systems: a stab system, and a hook system. 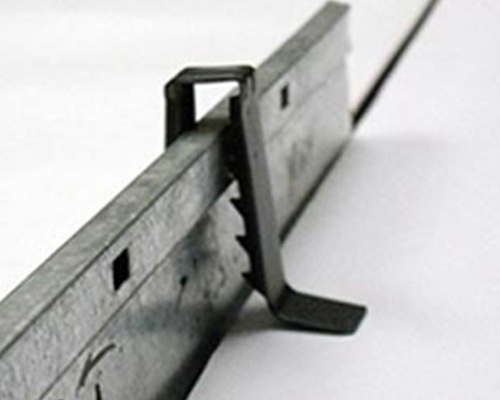 A stab grid system provides additional stability as the cross-tee overlaps the main beam to prevent twisting. This feature often qualifies stab systems for a Seismic Rating. A hook grid system is often a lighter-duty grid. See images below. All stab grid systems, like Classic Cliq, USG Donn DXL and Armstrong Prelude XL use an overlap design at the cross-tees. 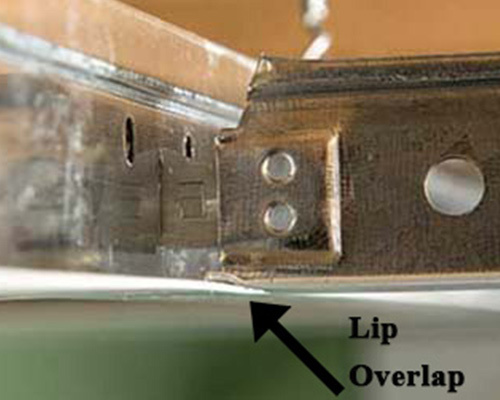 This causes about a 1/16-inch raising of the ceiling panel at the corners. This is the case for all ceiling panels, including Genesis, mineral board acoustic and vinyl-clad gypsum. See image below. See Genesis-LightReflectivity for technical information about Genesis ceiling panel light reflectivity.